Hello and welcome…. I’m John. I am an aspiring poet who has been writing poetry longer than my memory recalls. And that is so true. I feel that poetry is not purposely done, It’s really more like a fundamental part of who the poet is. It’s like sleeping or eating. When your passion erupts it just is, and you write it down just as when you sit at the table to eat when you feel hungry. Anyway that’s how I feel about poetry. And though I’ve been writing poetry all of my life, (while also using conjunctives such as ‘and’ to begin sentences for almost as long – much to the abhorrence of my sixth grade English teacher – Sister Collette, God rest her dear heart ) – I am still trying to find my poetic voice, which seems to change fairly often. In any regard I shall always consider myself an aspiring poet as I feel none of us could possibly know it ourselves if we have ever achieved that full level of mastery. I’m certain it is up to the reader to decide such and not the writer himself. And because there are so many potential readers – both now and after I am gone and buried – there is no way I could ever claim myself as a bona fide poet. In fact, I’d say that I am barely scraping by as human. I also like to hear myself talk – and feel that God has blessed me with exceptional logic ability. I’m sure that has nothing to do with my poetry – but it certainly makes me arrogant. For the first 50 years of my life I was embarrassed by my arrogance, often playing down my abilities to avoid seeming that way. But my second divorce made me realize that there are so very few people worth expending such worry over, even those you have devoted yourself to. So from that point forward I decided to no longer care how others perceive me. Now I only care of what I think of others. I am what I am, as my early childhood hero Popeye always said. And I, John, am simply arrogant. It doesn’t mean I don’t love others. But if you count the number of times that the word “I” was used in this paragraph – then you will be that much closer to understanding who “I” am. “I” counted 13 times. Four “me”‘s and five “my”‘s. 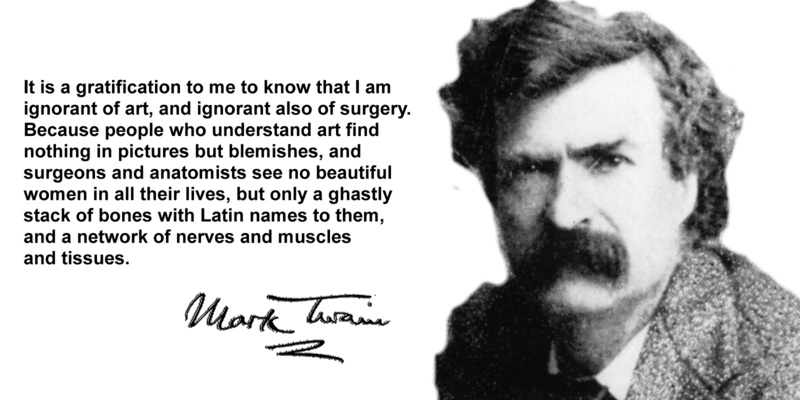 Above Twain was remarking on expert opinion which can easily overlook the beauty of any piece by dissecting its flaws. To me this analogy is perfect for critics of poetry who deem to define what poetry is. Can it be exact form, such as number of syllables or precise meter in a given number of lines and stanzas or repeating words and phrases? Certainly. And that can be fun – for the writer. But what for the reader? I think the reader might only enjoy it in admiration, as one might admire another’s ability to complete the Sunday Time’s crossword puzzle. Because that’s what most form poetry is: squeezing words into a geometrically shaped box. I think it robs the writer of a world-sized toolbox, or palette, so to speak. But I applaud those who can do it well. I simply regret that great poets such as Emily Dickinson were chastised for not con”form”ing to contemporary standards and therefore did not receive recognition during her lifetime for being perhaps the greatest American poet who ever lived. As for admiring form over content, I believe the art world would be at a loss without the addition of painters like Picasso. Coloring outside the lines can often be more beautiful than coloring within them. Sometimes beauty comes from using a conjunctive to start a sentence, because beauty is not a word, a sentence, or a paragraph. It is a flowing vision. When I sit down to a fine supper of fried catfish fillet I don’t want to see the creatures innards on the table’s centerpiece. For what purpose? Knowing that it once had a stomach and assorted entrails has little bearing for my taste buds. And comparing this part or that part to those of a catfish eaten long ago is of little consequence to me in all form. For that reason I am only an aspiring fisherman. And forever I hope to remain an aspiring poet. Thank you for coming by……. Dear John, what you have written above is so heartfelt and so true. It is itself poetry. You are a man who clearly knows what the very essence of poetry is, and should be, all about. Poetry is emotion. Emotion is poetry. Indeed, where I come from, we have the same word for both: Helayath. I can’t wait to read your work. Yours, TMP. To my kind friend, The Masked Poet: Thank you for those endearing words. Without doubt……. re-visiting a poem from long ago absolutely captivates me sometimes. It’s like reading it for the first time with a whole new set of emotions. And the same is true with others….. Reading Dickinson as a child made me appreciate nature, Today, she takes me to the extreme emotions of relationships and the heartfelt grief of losing those that you love. There is no question in my mind that God’s hand guides the true poets pen to touch the lives of so many and at so many different points in their lives. Poetry is the language of the heart. Thank you for your kind comments Victoria…. and your poetry. Claudia, you should know that I am absolutely humbled by you. Some of your poetry is among the best I have ever seen. I think all words have an aesthetic value, and combinations of words can move that ten fold. Your choices take that to the sublime….. You are simply beautiful. A year and a half of experience or 50, poetry comes from the heart and is only measured by what is found there, I think. One of my absolute favorite poems in this world was written by a 32 year old woman who had never written a single lick of poetry before in her life. Her heart was the only thing that made the poem possible. If you ever find a moment free, I hope that you will find her words: Do not stand at My Grave and Weep, by Mary Elizabeth Frye. And then find out why she wrote the poem. As for my verbose rant on your blog…… can’t apologize for being me. As I described above, good poetry makes the reader cry. And your touching poem about the death of your father at your age of 17 (“Meeting the Bar: our last day”) brought a flood of emotions ripping through me and images of my mother, who died similarly, came flashing into me. I don’t hide emotions, Claudia, and am not embarrassed to tell you that after reading your poem I sat in the dim glow of my basement office computer screen and cried for 20 minutes. Happy tears, though, my mother’s cancer and painful treatment was only a smidgeon of those memories I have of her. As I’m sure the memories of your lovely father can’t be reduced to that hospital room, steel stick or infusion he suffered. Those things are truly what make us who we are, I think. Without them we would be less, And sharing them in the most endearing way, through poetry, is what allows us to enjoy this beautiful, wonderful communion of life. Thank you for that, and thank you for touching my life…..
First and foremost, thanks for visiting and more so for your kind words. I believe this is the first visit and you’re most welcomed. I normally will become a follower and put those I find interesting onto my blog list so I would be prompted by a new posting the next time. I’ll do that for your blog. I only started blogging poetry a year ago.It took me a few hours to complete it ( It was bleary eyes at 3am when I finished) I took English Literarure as a subject in school and never that seriously. That was why it took that long. Now, I’m having fun. With the prompts given things are convenient for me. Cheers! Hi John, thank you for visiting my site and also for wishing that I would add the option to follow my blog in email. Well, if you revisit the site, you will see that I have done just that! I will also be following your blog, but through Google Reader (even though you don’t have the follow link), as that is easiest for me. You said that my terriers looked like Spot and Ginger. I am very familiar with Jack Russells, but these two are toy fox terriers (smaller than Jack Russells) who think (at 4 1/2 and 6 pounds) that they are mighty. I would like to see the poem about Spot and Ginger if you ever care to share it. Again, you will see me around your blog; and I hope I will see you around mine. so I followed you back. I was really moved with your Merry-Go-Round Poem. It was classic and hit a spot in my heart. I find your writing a breath of fresh air. Dealing with emotions in its truest form. Thank you once again for the visit. Hope to see you soon. John, thanks for the intro. I would submit that if you have been writing poetry for years, you are a poet, not an aspiring poet. Whether or not others have recognized that fact about you is another story. Complements for the new year!! Poetry is nice. Mark Twain is the man! I very much enjoy your words. I wouldn’t call you aspiring anymore. A very warm, passionate and a heartfelt introduction 🙂 I enjoyed reading it thoroughly as was captivated by it. A fantastic blog with some marvelous poetry that I’m glad to have found. I admire your passion for poetry, your art … I know good poetry when I read it; I’ve never seriously tried to write it. I believe it requires a lot of discipline. Thank you for sharing yourself! It was a pleasure to read your poetry. You are, by far, one of the best writers I’ve found online. John Allen Richter, from the standpoint of comments, what comment criteria do you have that you want to be met?